Lipstick-sized precision microscope lets you view a small amount of your saliva. A fern-like pattern indicates your most fertile days. 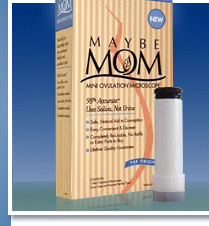 An ovulation detector for natural family planning. FDA approved as 98% effective if used as directed. Tiny size discreetly travels with you. No hormones. Carrying case and instructions included. Reusable. Lasts a lifetime.